﻿Quillpad is a free online Indian language typing tool. 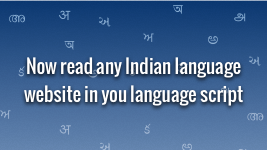 You can type in Hindi, Gujarati, Punjabi, Marathi, Telugu, Tamil, Kannada, Malayalam, Bengali and Nepali. For example, when you type 'aap kaise hain' in Hindi, Quillpad will convert it directly into Devanagari script. If you write a word like 'vishesh', first sh should become 'श' and the second sh should become 'ष'. Quillpad will intelligently do that for you. No need to use shift keys or to memorize any key mappings. So 'राष्ट्रपति' can be written by typing 'rashtrapati' or 'raashtrapathi'. Quillpad can also predict if multiple words are possible for your input. You can click on the word to select from those options. In addition Quillpad allows you to type English words freely in between Hindi words. It intelligently transliterates them into Hindi. Quillpad services will be SHUT DOWN from 1st January 2019. Please do take any back-ups of your work saved on www.quillpad.in. Thanks for the overwhelming support extended for more than a decade. We hope open sourcing Quillpad will enable companies and individuals to improvise and build on top of this state of the art Indic input technology. With the full source available, you will be able to host your own Quillpad server. Typing in Bengali is very easy with Quillpad. Eg: To write a Bengali sentence এখন বাংলই লেখা খুব সহজ. Simply type Bengali words in English letters, like, ekhon banglai lekha khub sohoj. Quillpad will intelligently convert your English input into Bengali script! With Quillpad Roaming you will be able to write in Bengali on facebook, twitter, email, blogs etc, directly on those websites. No need to type it somewhere else and copy paste to where you need it. You should try this simple to use online service by visiting http://roaming.quillpad.in. It is free. 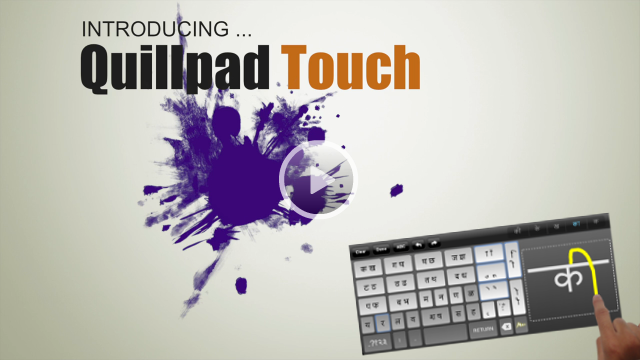 Quillpad Touch provides an easy way of writing in Hindi. While you can use the intelligent keyboard to write quickly, handwritten gesture recognition makes it fun and exciting. You will enjoy writing to your loved ones, posting messages online, sharing jokes, searching for lyrics and more. All in your own language. Can't read Hindi or any regional language fluently, but can understand it well? Typing in Gujarati is very easy with Quillpad. Eg: To write a Gujarati sentence હવે ગુજરાતી મા લખવુ બહુ સહેલુ ચે. Simply type Gujarati words in English letters, like, have gujarati ma lakhvu bahu sahelu che. Quillpad will intelligently convert your English input into Gujarati script! With Quillpad Roaming you will be able to write in Gujarati on facebook, twitter, email, blogs etc, directly on those websites. No need to type it somewhere else and copy paste to where you need it. Eg: To write a Hindi sentence हिन्दी में लिखना बहुत आसान है. Simply type Hindi words in English letters, like, hindi me likhna bahut aasaan hai. Quillpad will intelligently convert your English input into Hindi script! 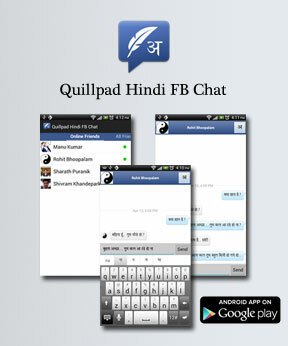 With Quillpad Roaming you will be able to write in Hindi on facebook, twitter, email, blogs etc, directly on those websites. No need to type it somewhere else and copy paste to where you need it. Typing in Kannada is very easy with Quillpad. Eg: To write a Kannada sentence ಈಗ ಕನ್ನಡದಲ್ಲಿ ಬರೆಯುವುದು ತುಂಬಾ ಸುಲಭ. Simply type Kannada words in English letters, like, eega kannadadalli bareyuvudu tumba sulabha. Quillpad will intelligently convert your English input into Kannada script! With Quillpad Roaming you will be able to write in Kannada on facebook, twitter, email, blogs etc, directly on those websites. No need to type it somewhere else and copy paste to where you need it. Typing in Malayalam is very easy with Quillpad. Eg: To write a Malayalam sentence ഇപ്പോള്‍ മലയാളം എഴുതാന്‍ വളരെ എളുപ്പമാണ്‌. Simply type Malayalam words in English letters, like, ippol Malayalam ezhuthan valare eluppamaanu. 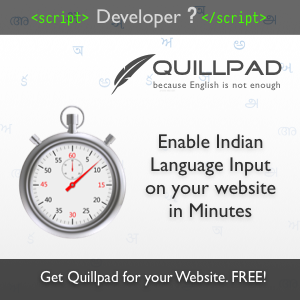 Quillpad will intelligently convert your English input into Malayalam script! With Quillpad Roaming you will be able to write in Malayalam on facebook, twitter, email, blogs etc, directly on those websites. No need to type it somewhere else and copy paste to where you need it. Typing in Marathi is very easy with Quillpad. Eg: To write a Marathi sentence आता मराठीतून लिहीणे खूप सोपे आहे. Simply type Marathi words in English letters, like, aata marathitun lihine khoop sope aahe. Quillpad will intelligently convert your English input into Marathi script! With Quillpad Roaming you will be able to write in Marathi on facebook, twitter, email, blogs etc, directly on those websites. No need to type it somewhere else and copy paste to where you need it. Typing in Tamil is very easy with Quillpad. Eg: To write a Tamil sentence இப்போது தமிழில் எழுதுவது ரொம்ப சுலபம். Simply type Tamil words in English letters, like, ippodhu tamilil eludhuvadhu romba sulabam. Quillpad will intelligently convert your English input into Tamil script! With Quillpad Roaming you will be able to write in Tamil on facebook, twitter, email, blogs etc, directly on those websites. No need to type it somewhere else and copy paste to where you need it. Typing in Telugu is very easy with Quillpad. Eg: To write a Telugu sentence ఇప్పుడు తెలుగులో రాయడం చాలా సులభం. Simply type Telugu words in English letters, like, ippudu telugulo raayadam chala sulabham. Quillpad will intelligently convert your English input into Telugu script! With Quillpad Roaming you will be able to write in Telugu on facebook, twitter, email, blogs etc, directly on those websites. No need to type it somewhere else and copy paste to where you need it. Typing in Punjabi is very easy with Quillpad. Eg: To write a Punjabi sentence ਹੁਣ ਪੰਜਬੀਚੇ ਲਿਖਣਾ ਬੌਤ ਆਸਾਂ ਹੇ. Simply type Punjabi words in English letters, like, hun punjabiche likhana baut aasaan he. Quillpad will intelligently convert your English input into Punjabi script! With Quillpad Roaming you will be able to write in Punjabi on facebook, twitter, email, blogs etc, directly on those websites. No need to type it somewhere else and copy paste to where you need it. Typing in Nepali is very easy with Quillpad. Eg: To write a Nepali sentence अब नेपालीमा लेख्न सजिलो छ. Simply type Nepali words in English letters, like, aba nepalima lekhna sajilo cha. Quillpad will intelligently convert your English input into Nepali script! With Quillpad Roaming you will be able to write in Nepali on facebook, twitter, email, blogs etc, directly on those websites. No need to type it somewhere else and copy paste to where you need it. Quillpad Prediction Algorithm gets US patent. Ram Prakash awarded the MIT TR35, Top Innovators Under 35 Award. Quillpad in The New York Times. Quillpad wins 'Best in Innovations' award. How to type in Indian languages on other websites? Does Quillpad Use Dictionary for Prediction ? Autocomplete suggestions using binary search. Copyright © 2012 - Tachyon Technologies P Ltd. All RIghts Reserved.